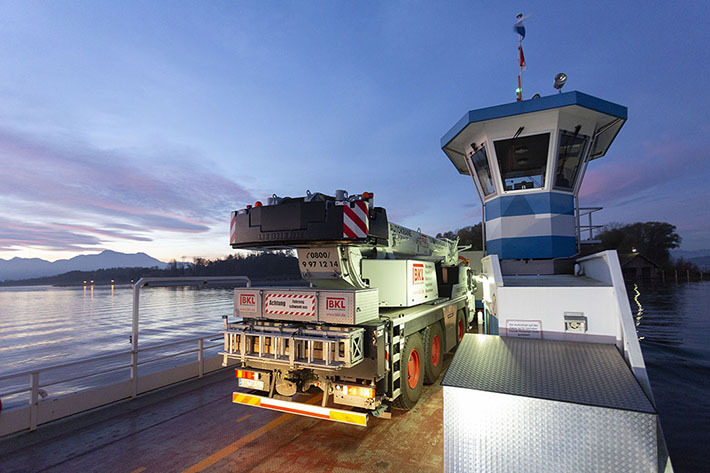 On its way – the cargo ferry crossed Chiemsee to Herreninsel with the mobile crane on board before dawn. Before dawn, the Liebherr LTM 1060-3.1 mobile crane rolled onto the cargo ferry at the pier on the north bank of the lake. This small car ferry, which normally ships craftsmen and vans over the lake, safely transported the crane on the short crossing of around one kilometer to Herreninsel. Its destination was the palace’s parks, which were built on the island around 1880 by King Ludwig II of Bavaria, who took his inspiration from the Palace of Versailles near Paris. To protect the large fountains from snow and frost, large scaffold hoods are erected every autumn over the fountains which feature numerous figures, and then covered with tarpaulins. The individual metal constructions used to make the hoods for the fountains had been assembled in the days leading up to the mobile crane’s arrival next to the fountains. Since the mobile crane had to be assembled outside the giant drained water basins, a radius of 24 meters was required to erect the scaffold elements, which weighed over two tonnes. Dariusz Jagiello had extended the boom on his Liebherr crane to 45 meters for this purpose. 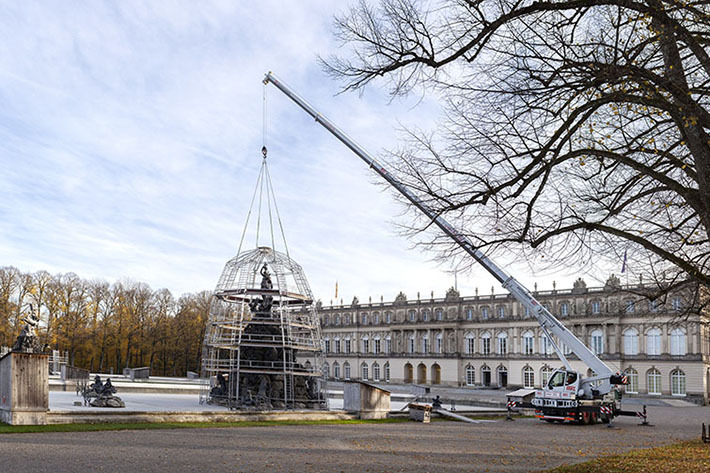 The experienced crane operator lowered his loads precisely over the fountains, measuring up to 13 meters in height, with extreme care and following the instructions of the fitters. This required the crane control system to execute manoeuvres with millimeter precision as the scaffold components had to be positioned from a suspended position on the elements which had already been installed and then connected to them.